When Judge Neil Gorsuch interviewed to be appointed to the U.S. Supreme Court, he was never asked to promise he would overturn abortion rights protection under Roe v. Wade, the prospective justice said Tuesday. Several Democratic senators pushed Gorsuch to elaborate on whether he would consider overturning the decades-old precedent protecting women's right to choose. President Donald Trump has long promised to add pro-life justices to the high court bench, and Democrats have worried Gorsuch meets that criteria. But Gorsuch said during day two of his confirmation hearing before the Senate Judiciary Committee that he was never asked to pass that litmus test. If he had, “I would have walked out the door,” Gorsuch told Sen. Patrick Leahy (D-Vt.). Gorsuch—currently a judge sitting on the 10th U.S. Circuit Court of Appeals in Denver—repeatedly underscored the importance of giving legal precedents such as Roe v. Wade adequate deference. When it comes to Roe v. Wade, Gorsuch said it was a precedent that had been “reaffirmed several times” and all Supreme Court precedent deserves respect and consideration. But Gorsuch refused to say whether he would overturn the ruling or pre-judge any issues that could come before the Supreme Court, including the application of the Religious Freedom Restoration Act, which he and the Supreme Court both ruled limited the reach of the Affordable Care Act's contraception mandate. In one of those cases—Hobby Lobby v. Sebelius—Gorsuch and his colleagues ruled that company owners' religious beliefs superseded the right of workers to access contraception. That decision was later upheld 5-4 by the U.S. Supreme Court. Gorsuch called Hobby Lobby and another case involving the mandate “hard cases” where he and his colleagues applied the law based on the purpose they could derive from its text. Under the law, corporations can be considered people, and it would up to Congress, not the judiciary, to change the law. 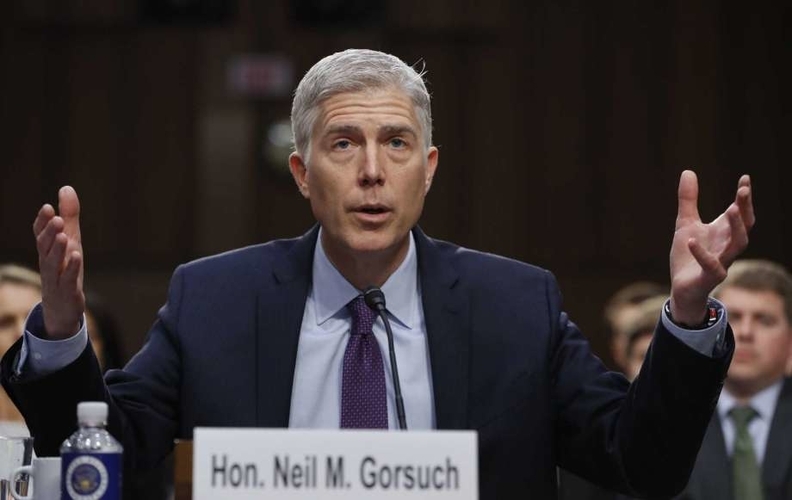 Gorsuch told the senators Tuesday that he would use a similar textualist approach in other cases.